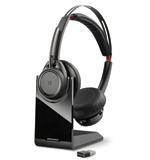 This is the Plantronics Voyager Focus UC B825 stereo Bluetooth headset for PC -Smartphone/tablet (or Bluetooth desk phones). It offers seamless connectivity to your PC or smartphone via USB, with most leading UC soft phones, it’s ready to work how you do. Class 1 Bluetooth range (up to 150 feet of wireless range). Voyager Focus UC allows you to be mobile for voice calls and music, whether you’re at your desk, in the lunch room, or in the parking lot. Equipped with both active and passive noise canceling technology. Advanced mute controls, three precision-tuned microphones and high-definition stereo sound. * Wideband audio with noise canceling for high quality PC telephony and compatible with smart phones enabled for HD Voice.